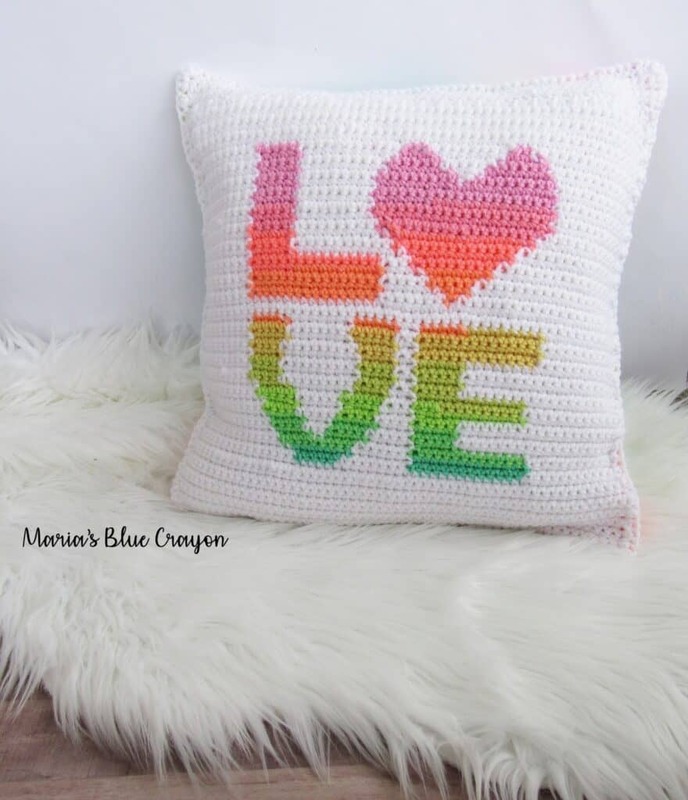 Scroll down to find the free crochet tutorial for this LOVE pillow cover. Save it Ravelry or PIN it for later. 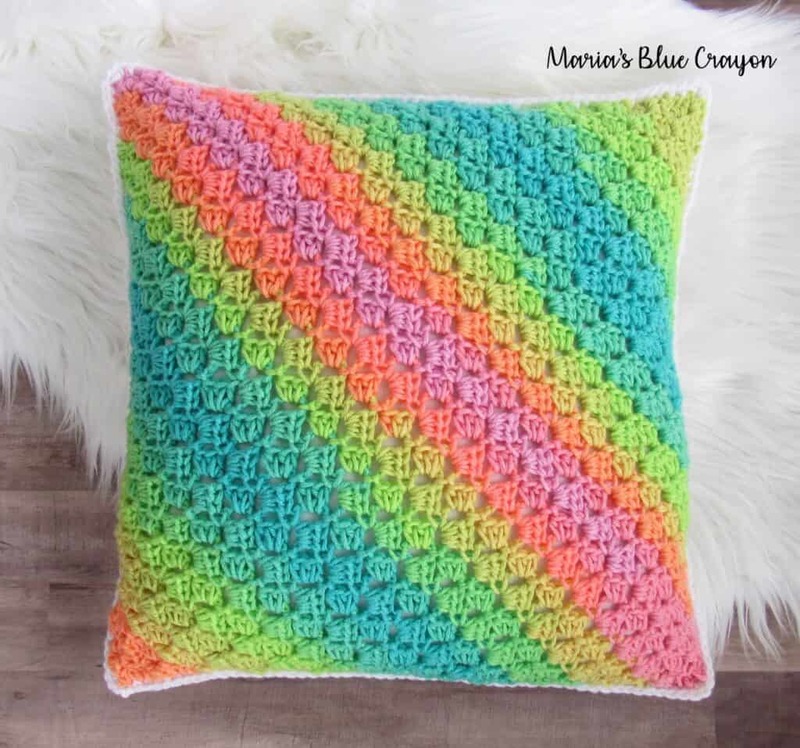 This pillow combines some of my favorite things – a good, gradient yarn and a fun, easy project! If you are new to crocheting graphs and/corner to corner – don’t worry! The internet is a marvelous place to learn these two different techniques. Unfortunately, I don’t have much time at the moment to create tutorials myself, but just search YouTube! 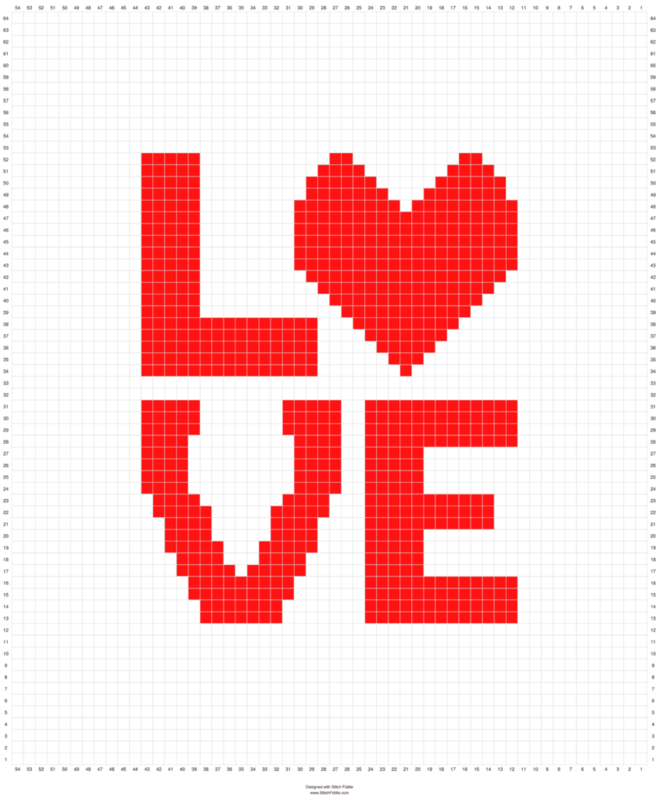 You will find lots of tutorials for crocheting graphs and how to achieve C2C (corner to corner) there. I highly recommend Mikey from the Crochet Crowd for video tutorials. He has a very great way of explaining things! 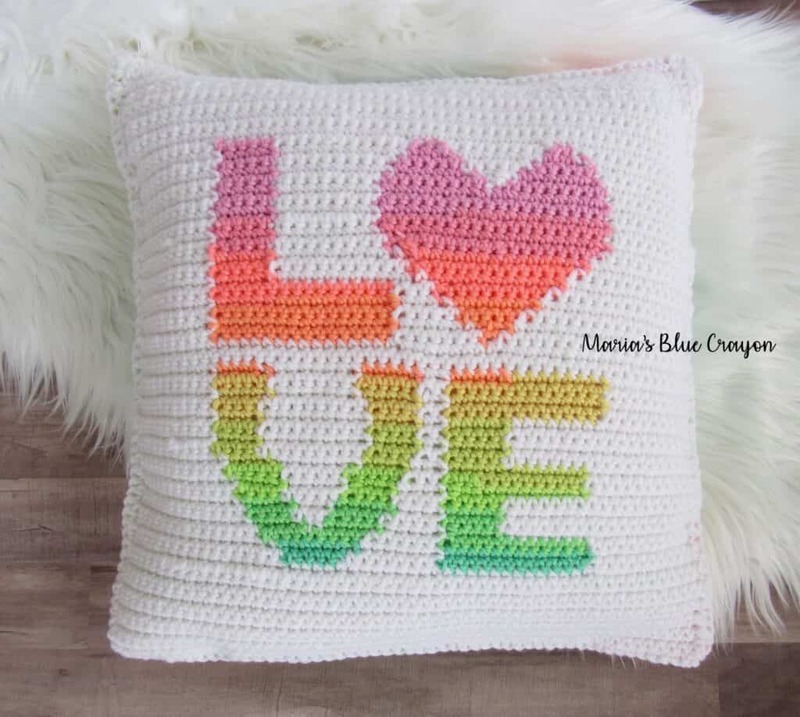 For this pillow cover, I used the bobbin method for crocheting the graph. I actually started by using tapestry crochet, which is where you crochet over the yarn you aren’t working with for a particular section, but the color parts were showing up over the white parts and it didn’t look ‘clean’ enough. To achieve the perfect gradient, I had to take apart my yarn. 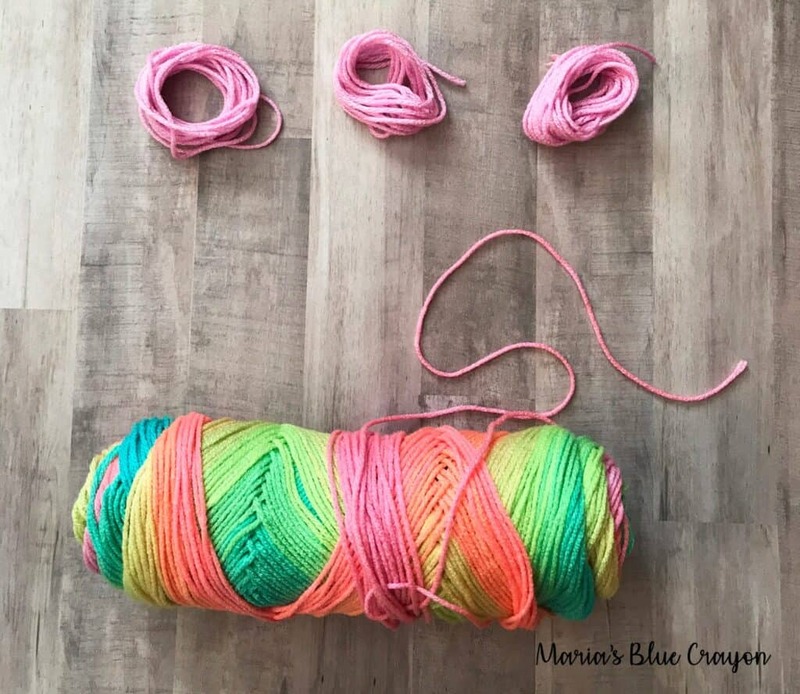 I unraveled the first color on my skein and cut it up into 3 equal parts. I started from the top of the pillow (top of the ‘L’ and ‘heart’), so I needed 3 different bobbins of the color to start – hence cutting up the first color into 3 different parts. I continued to do this for each color once I ran out of the color I was working on. It was a bit of a pain at first, but I got the hang of it. As you can see, the result of a perfect gradient was well worth it! For the back of the pillow, I wanted to do something fun with the yarn that wasn’t just single crochet like the front. I chose to do corner to corner (C2C), because I haven’t done it in quite some time and it’s actually one of my favorites to crochet! 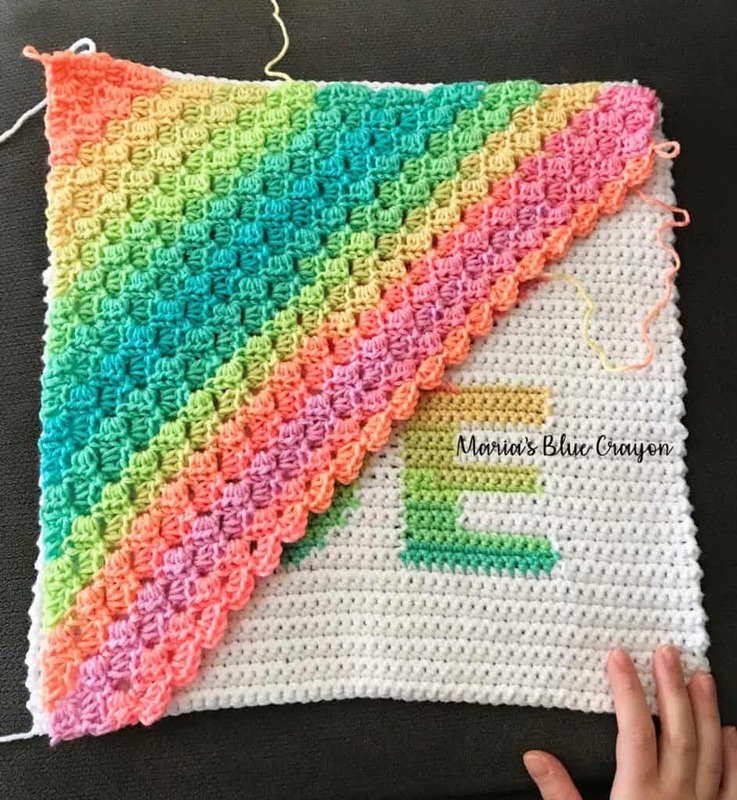 The corner to corner backing makes a beautiful diagonal gradient and compliments the front very well! I typically do the corner to corner using double crochets, but this time I used half-double crochets to make the ‘squares’ smaller. All in all, I’m really happy about the results of this pillow cover! It gives my living room a fun pop of color for Valentine’s and while we wait for warmer, sunnier days ahead! Want to make it later? 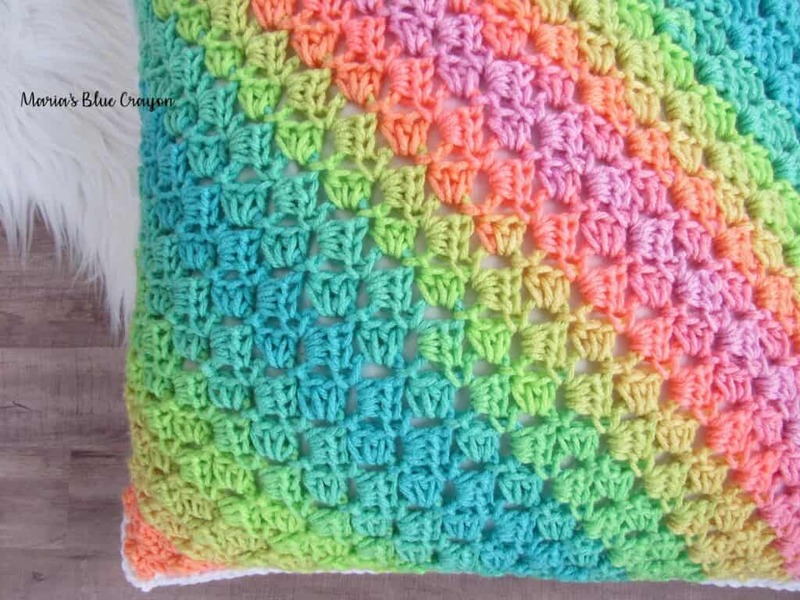 You will also need to know how to crochet C2C (corner to corner). The cover will fit a 16″ x 16″ pillow form. To complete the front portion of the pillow cover, you will complete the graph above in single crochets. I worked from the top down and used bobbins. To create that ‘perfect’ gradient, I unwound the first color of the Red Heart Stripes and cut it off from the rest of the skein. Starting at the top, I needed three sections of color for the wording so I cut the yarn I unwound into three equal parts. The back cover is made with corner to corner (C2C) using half double crochets. Keep increasing until one side is as long as the front cover then start to decrease. Keep decreasing until your square/back cover complete. I have not included a written pattern for C2C as it’s easier learned visually to grasp the concept. Again, YouTube has great tutorials for this! Use stitch markers or pins to secure both the front and back side of the cover together with the ‘wrong sides’ facing inside. Using white and your crochet hook, single crochet the pieces together. Make 3 single crochets in each corner. Once you have crocheted 3 sides, put in your pillow insert and continue to single crochet the front and back pieces together. Fasten off and weave in your ends. I hope you enjoy making this project! I apologize I was not able to give you the video tutorials myself, but I am very busy at the moment with moving into a new home – I hope you understand! What a LOVEly pillow <3 ! Thank u for sharing the pattern, it's really soo nice! I can't wait to start this!! Gorgeous pillow full of love. Thanks for sharing this pattern. Think about the extraordinary circumstances throughout your life when presents were given or got. What is more perfect, astute or fun than an agreeable pillow? There is a gigantic assortment of pillows that fill numerous needs from help and solace to brightening and fun. I find a very good website for the toptenpillow. If you want you can visit this site.